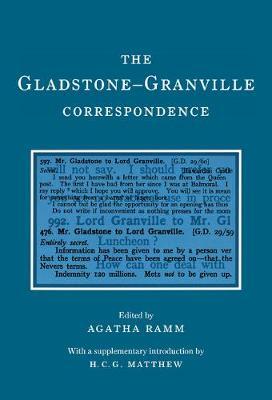 Agatha Ramm's two volumes containing correspondence between Gladstone and his Foreign Secretary, Lord Granville, conducted at the height of British colonial power during the years 1868-1876, were published originally in 1952. This correspondence is now available in a single volume, and lends the mass of government papers usually studied by historians 'the enlivening touch'. The correspondence contained in the volumes is between two men who wrote to each other privately, but about matters which were, as Professor Matthew states in his introduction, 'the very stuff of official diplomatic exchange'. It also deals with the period of opposition during Disraeli's government of 1874-1880, as well as a wide range of non-political matters, in which the two men were active whether in or out of government. This Reprint gives the reader a valuable insight into the two correspondents and will, therefore, be of great interest to scholars of British history.